During a recent tour of the magnificent southern island of New Zealand, I came across a small village named Papatowai. 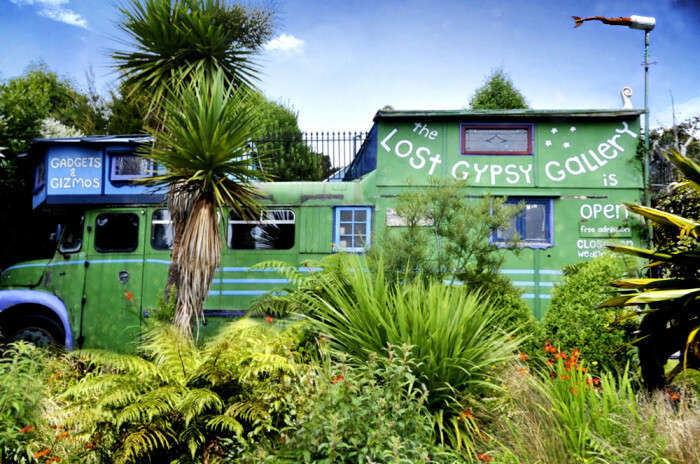 In the heart of the village sits a caravan named "The Lost Gypsy". It is run by a fine fellow by the name Blair, who seems to me to have found the key to happiness. I have often argued that happiness is not to be found in material wealth and I have claimed that my own happiness is due, in part, to not desiring material possessions. One needs food, shelter, and friends, but beyond this, additional accumulation is unnecessary. The Lost Gypsy lives a peaceful life. He tinkers with recycled material, turning them into curious works of art. As far as I can see, he has little need for material wealth and is content to make art and converse with passers by. It is a life of little stress. This argument does not tell us what we need to be happy. But if it is sound, it shows us that the pursuit of luxury gets in the way of happiness. As far as I can tell, The Lost Gypsy has shed the common belief that one needs luxuries to attain happiness, and thus he has removed an impediment to happiness which has allowed him to focus on other things. These have resulted in his happiness. Still, as a closing thought, I wonder if the constant desire to find recycled material to create new art works may get in the way of true happiness for the gypsy.